Female models required for a large two-day wedding event at The Royal Bath & West Showground, Shepton Mallet, BA4 6QN, on 3rd and 4th March 2018. Models will be wearing various bridal dresses, bridesmaid dresses and mother of the bride. Models will also have professional hair and makeup provided each day and your lunch and refreshments will also be provided by The Wedding Showcase team over the weekend. I am looking for all sizes including some beautiful plus size figures, and age has no limit! There is no experience needed for this, all we ask is for a smile. 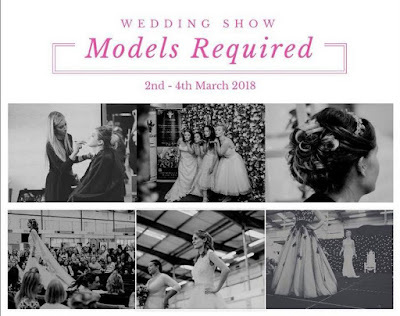 IMPORTANT - All models must be able to travel to the Showground (BA4 6QN) and be available on Friday 2nd March from 3.00 p.m. for a couple of hours for a rehearsal with all models and dress companies involved. Then again on Saturday 3rd and Sunday 4th March from 9.00 a.m. - 3.00 p.m. (or until the final catwalk show). There will be two catwalk shows on Saturday and another two on Sunday. You will be required for both days. All professional photos can be kept for portfolios or personal use after the event. We are also more than happy to provide any references for future work, jobs, contracts, after working with you.